The LG G4 has been on our minds for a while now, and with the Samsung Galaxy S6 and S6 edge now a reality, it's only sharing that mental space with the also unreleased Sony Xperia Z4. Word on the street is that we'll get to see an LG exec unveiling the thing in a month's time, but until then we're on our own, and that means leaks and rumors. Thankfully, today just got a whole lot better in terms of that. A device named LG G4 (F500x) has been caught passing through GFXBench's suite, spilling the beans in terms of hardware specifications. According to the details the benchmark cared to note down, the LG G4 will have a 5.5-inch display, touting a resolution of 1440 x 2560 (534 pixels per inch), and run on, get this, a Snapdragon 808 silicon from Qualcomm. We're talking about a 64-bit, hexa-core (4+2) processor here, with four ARM Cortex-A53 and two ARM Cortex-A57 cores plus an Adreno 418 GPU. As you can imagine, the Snapdragon 808 sits lower on the food chain than the octa-core Snapdragon 810 and its superior Adreno 430 graphics, but more on that later. The rest of the specs include 3GB of RAM, 32GB of internal storage (no mention of a microSD slot), a 16-megapixel main camera capable of 4K UHD video capture, and a generous, 8-megapixel selfie snapper. Going back to the rather dumbfounding case of the Snapdragon 808 processor, we have two theories to offer. One, it could be that the Snapdragon 810's oft-cited heating problems could have forced LG to go for the ostensibly weaker Snapdragon 808, or two – this could be a lower-end model. 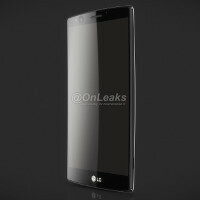 Indeed, we've already heard rumors that the LG G4 will not actually be the company's top-of-the-line device this year – a position that will supposedly be taken up by the LG G4 Note, which could carry the industry's hottest whenever it gets released. Alternatively, this could be some sort of error, as unlikely as that would be. Thanks for the tip, Davide! I'm extremely happy they went with the 808. No overheating. And 2+4 is theoritically the optimal solution for a big.LITTLE SoC. Hello Tyrion, is 808 a 64 bit processor or not?, Don't really have and idea. Yes, it's a 64 bit processor and should lead to great battery life. The performance should be on par with 805. GPU is weaker than the 420 though. But it's more efficient than the 420. 420 performance in benchmarks is great but it throttles in real games and can't sustain the performance. The 418 can surpass that if it's efficient. I am extremely happy and very satisfied already if LG indeed uses the 808 and not the problematic 810. 808 is still a beast and there is no huge margin in processing power compared to 810. In fact, if i were to choose between the cooler and more efficient 808 giving a longer lasting battery and no throttling in graphic-intensive games, i would prefer 808 over 810 any day, at least until 815 is released at the end of the year. 815 will probably appear in the Nexus 2015 at around December release, including the G4 Note. But 808 is definitely the wise choice for 2015, given the overheating issues that plagues the 810. 808 is basically 810 with two cores less. And Adreno 418 is Adreno 330 equivalent. Overall this setup is SD801's equivalent. 418 is in between 330 and 420. It's more efficient than both. Yes, but it's 64 bit which is always a plus. 808 is a 810 with two cores less and weaker GPU. I guess 808 is a wise choice. Hexa core, so a bit more power efficient than octa core. But does this also confirm that the 810 in the G Flex 2 really has issue that LG can't solve? It's on par or a bit lower to Adreno 420, and more power efficient. Qualcomm should make the S810 in hexa core instead of octa core. I agree totally! The 808 is more than enough and then some. Hope there will be more 808 phones to come. Cheaper than the 810 phones too, I hope. 808 is 801's equivalent. Combine that with QHD resolution and it doesn't look so good anymore. Ppl rly compare them linear. Take into account the QHD and everything, we gonna have another G3 laggy phone this year. And probably bad battery life too. This also could be another G4 variant like the Vigor, Vista, Stylus or the other devices that had a Gx moniker last year but lower specs than their daddy. I wish LG the best. I hope they will aggressively market this phone and do well in the market especially in the South Korea and USA market.